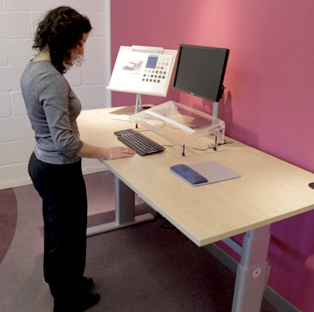 Height adjustable desking allows the user to vary their height between sitting, ‘perching’ and standing and in so doing help many users reduce the negative effects of prolonged sitting by adapting a standing or ‘perching’ posture depending on their individual requirements. 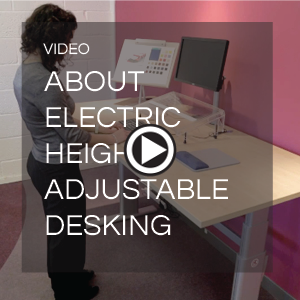 Many physiotherapists recommend that some of their clients use height adjustable desking to help with various musculoskeletal problems when working at DSE workstations. We have a vast amount of experience that can help you in the right choice of desk and also matters regarding the incorporation of ancillary equipment and effective wire management so that you end up with an integrated solution for better ongoing functionality. Our experienced installation teams also provide an efficient, considerate and attention to detail orientated service to help you get under way with your new desk from UFFICIO quickly.